A very special party and show is took place on Saturday, December 10, 2016. Founding artists exclusively sold at Tilting at Windmills Gallery for over 40 years were on display and some were present. Tilting was founded by Sean Hunt and began as a small print shop in the center of town in 1971. The business took off quickly and out grew it’s space causing the original owner to purchase property on 24 Highland Ave. The building originally was a small grocery store known as Pop’s Store. It then went on to be a health center for some time. The old building was transformed into a custom designed a gallery downstairs and frame shop upstairs that had the honor of winning the “Gallery of the Year Award” with Decor Magazine in June 1990. Sean also became a master framer and published a book on custom mat designs. He was the creator of the vgroove. In 1989 Harry and Suzan Claytor became the second owners of Tilting and carried it very successfully thru 2013 marketing more fine art originals for over 25 years. Terry Lindsey became the third owner of Tilting in 2013 transitioning from her Terry Lindsey Equidae Gallery in Saratoga for 14 years. The gallery now bursts with new expression from a very wide variety mediums and styles. Terry has a passion for art and manages to squeak in time to paint some of her own oils, which have sold with Tilting for over 25 years. 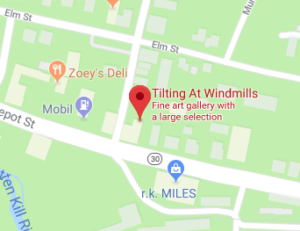 For 45 years Tilting has been revered as one of the best destination fine art galleries in New England.